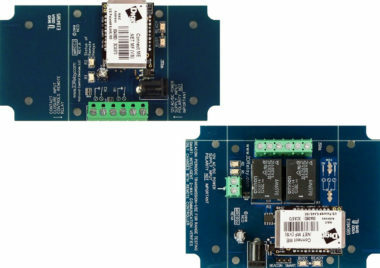 Our MirX 8-Channel Solid-State Relay Controllers are manufactured in pairs, designed to work together when powered up using wireless communications. The contact closure inputs on controller A control the relays on controller B. Similarly, the contact closure inputs on controller B control the relays on controller A. MirX controllers employ long-range wireless communications, we have tested line of sight range up to 2 miles. With rooftop antenna, ranges of 28 miles may be achieved. Urban and indoor installations typically achieve a 1,000 to 2,000 foot range, depending on type of building structure and wireless environment. 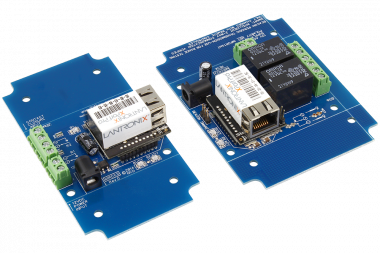 Customize this MirX controller for the type of solid-state relays your application requires during the order process. 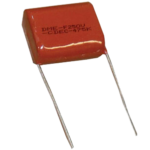 Solid-state relays are of the SPST variety, and are typically used for high-reliability and long-life AC or DC switching applications. Remotely control motors, pumps, valves, solenoids, lights, and other heavy duty electrical equipment by simply wiring a switch in one location to control your electrical equipment in a remote location. On-board Relay status LEDs and busy/ready LEDs let you know when these controllers are talking to each other. When communications is lost, on-board relays will automatically deactivate within 30 seconds (user selectable option). No Computers, No Configuration – Works Right Out of the Box. 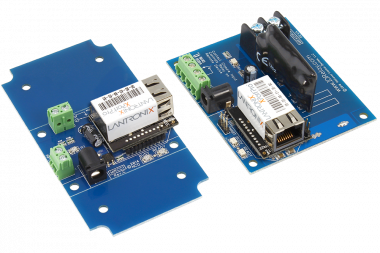 MirX controllers stay connected to each other using wireless communications. Inputs on each controller activate the relays at the opposite controller. MirX controllers are always talking to each other. They stay in relentless communications for optimal reliability. Should they lose communication with each other, they will keep calling out for each other until they find their mate. 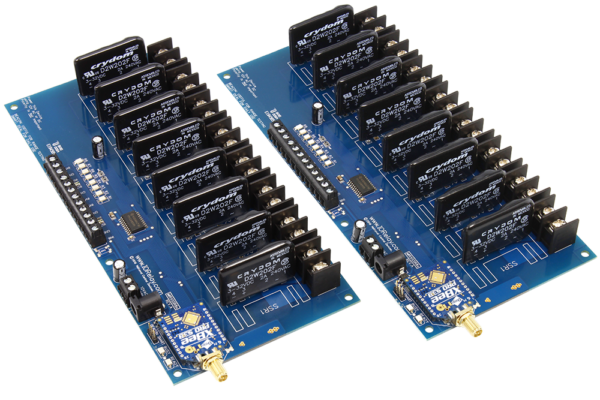 Since MirX controllers are married to each other, it’s possible to have several MirX pairs in the same area without any significant interference. Every MirX controller is equipped with contact closure inputs and relay outputs. The inputs on one controller activate the relays on the remote device using wireless communications. The “X” in MirX refers to the crossover. Since both devices are equipped with contact closure inputs and relays, each device targets and controls the remote device. Every MirX controller is equipped with a Busy/Ready LED. If the Busy LED flashes, this indicates the remote device has successfully received and accepted your contact closure status. If the Busy LED does not flash, the remote device is out of range. Beacon Mode communicates with a Remote MirX controller many times per second, refreshing Relay Status information every time a valid data stream is received by the remote device. Relays are only refreshed when a valid data packet is received. If data is lost, the Ready LED will stay on and Relays will stay in their current state. If the remote MirX controller is in range, the Busy LED will flash periodically, indicating valid communications between devices. Beacon Mode is slower than Smart Mode and is used primarily for initial testing of two devices. Once you have determined an installation location for both MirX controllers, move the Beacon/Smart jumper to the Smart position. Smart Mode communicates to the remote device any time a change is detected on the local device. Otherwise, the controller periodically checks to make sure the remote device is in range. Smart Mode reduces power consumption and is significantly faster than Beacon Mode. Smart Mode is the preferred mode for daily use in most applications. Note that each MirX controller can be set to a different mode and jumper changes take effect immediately. Again, the Busy LED will indicate the remote device is properly communicating. Smart Mode will also verify the relays on the remote device are properly set. If they are not, Smart Mode will attempt communications until the remote device responds. 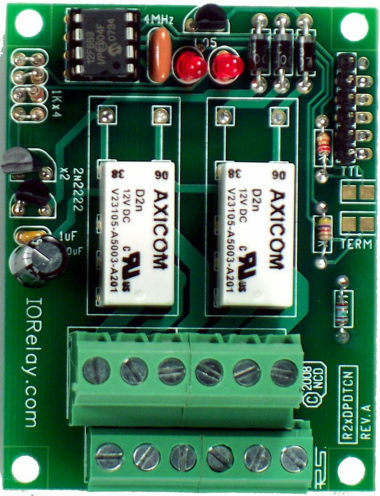 If communications is lost between the MirX controllers, all relays will automatically shut off within 30 seconds. If this is not desirable, Beacon Mode should be used. Perhaps the most notable difference between Beacon and Smart Mode is how relays respond if communication is lost. In Beacon Mode, the relays will stay in their current state and will not change unless a new data packet is received. In Smart Mode, relays will turn off automatically in 10 to 30 seconds if communications is lost between MirX controllers. The distance between MirX controllers will affect reliable operation. MirX controllers will offer better range if two MirX controllers are within line of sight of each other. If it is not possible for two MirX controllers to see each other, it may be necessary to use larger antennas. We can provide signal repeaters for extreme circumstances, but this solution is generally not recommended unless absolutely necessary. Typical communication range in indoor or urban environments is 1,000 to 2,000 feet using the included antennas. Outdoor Line-Of-Sight Range is 4-9 miles using 2.1dB dipole antennas. Using high-gain antennas, 28 miles of wireless range may be possible in some Line-Of-Site locations. Normally, MirX is shipped without encryption. However, NCD engineers will encrypt MirX communication data upon request. Please put a note in the special instructions field if you would like data secured between MirX controllers. MirX devices are only sold as a permanently married pair, pricing shown on our web site indicates pricing for the pair of controllers. Contact Closure Inputs may only be connected to switches, buttons, or sensors with Contact Closure capability. Not suitable for use in voltage detection applications. MirX devices use Digi.com 900HP-S3B communications modules at 900MHz. Data is transacted using two-way communications to ensure the remote device is properly functioning. The Busy LED is always used to indicate a properly functioning remote device. If you do not see the Busy LED flash, then the MirX controller is unable to communicate to the remote device. A flashing busy LED is your verification that all communications are functioning properly between MirX controllers. 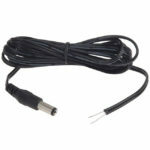 Please Note: Users must NEVER apply any voltage to an input on the MirX controller, these inputs are for Contact Closure connections only. Please Note: Relays provide a contact closure output. They do not provide a voltage output. 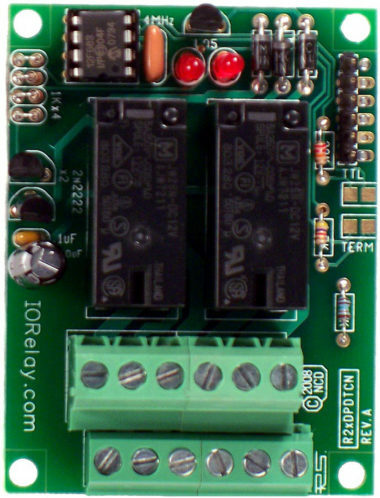 On-Board relays will switch a voltage that is provided externally by the user. 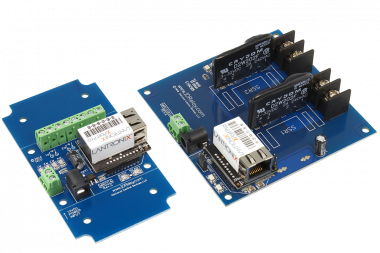 Learn how MirX Relay Controllers work and how to get the most out of them. 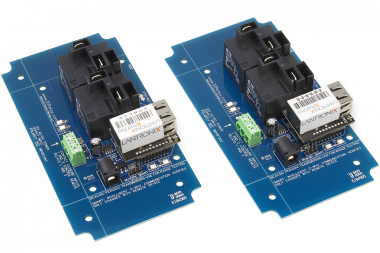 MirX is a powerful two way relay control technology using simple contact closures to control remote relays. A contact closure in one location trigger the corresponding relay in another location on a married pair. No wires, no software, it just works. This contact closure can be a simple switch, or any sensor that outputs a contact closure such as some current sensors and most proximity sensors. 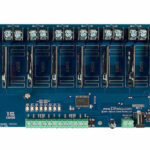 This configuration includes a Mirror Series 8 Input + 8-Channel Solid-State Relay Controller. 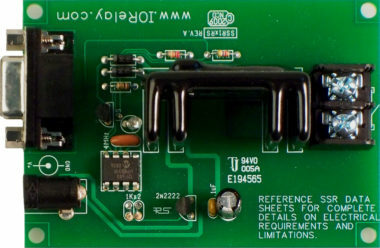 The Transmitter and Receiver versions of this controller are identical, allowing the inputs on one controller to control the relays on the remote controller. 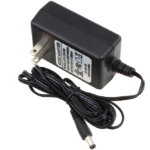 This device includes the 900HP-S3B 28-Mile Range Wireless Communications Module. Please choose a power solution for powering this transmitter. Please choose a power solution for powering this receiver.